How to change WordPress Posts Order ? The WordPress core developers implemented this great tool called “custom post type”, but a very limited method to make such posts content ordered was supplied. This great plug-in come to help on that matter, any custom post type hierarchically or not can now be sorted by category, date, search, through a very easy and intuitive way using a jQuery Drag and Drop Interface driven by an AJAX engine. This is simple to answer, do you need to order WordPress custom post types including default posts and pages? If so this is the right tool for you, this is the best and most advanced plugin of it’s kind you can find. For the free version, we got near 100% rating (Check with WordPress Plugins Repository). This advanced post order plugin bring in all features you need to make the sort process incrdible easy and fully controlled. I love the fact that your plug-in is very easy to use and came to it from a recommendation by Pagelines who created the theme PlatformPro. This plug-in is what I’ve been looking for for a long time! Thank you for this! What other features than free version this advanced post types plugin bring in? One of the important update is the possibility to sort the post types by custom taxonomy terms (i.e. categories). This will help to organize the WordPress posts order for each section separately. A date filter and a search it’s also available to choose the exact posts you need to order. You can toggle the thumbnails for posts to make an easier identification upon the order you want/need. This is a nice feature especially if you make the order upon the content of the post types thumbnails. Select between the post types you want to sort, the re-order menu will appear only for these. You can always disable/enable a post type order, the query update will change accordingly. Reverse bbPress Replies Order and show the newest posts first by selecting a simple checkbox. Also bbPress Forums and Topics sort is supported. How about to auto-sort the post types by a custom field? Let’s say you use another plugin which create custom meta to hold certain piece of information. Chose the Custom Field option, then enter the Field Name you need to sort on. Set Fixed Position (Sticky) for objects in the list so they will always show in required place. When publishing new posts, the sticky objects will stay in place as defined. Conditionals and sort query rules can apply, for making a sort to match exact front site section (i.e. front page, archive, search etc). This helps to promote certain posts, ads, general data which count for SEO and Marketing campaigns (How to set Sticky posts with your sort lists). The Sortable drag & drop interface can be set as list / grid view type for a convenient access. This makes sorting like WooCommerce Products very intuitive. When sorting large lists of objects the pagination feature is available to help. This facilitate an easy way to control a long list of objects by splitting the data into small chunks. The number of objects per page can be predefined through the sort settings. Also a number of offset objects can show up above and below the main sort list to facilitate easy transition of objects from a page to another. This settings is also available for change through sort settings area. (Sort List Settings). 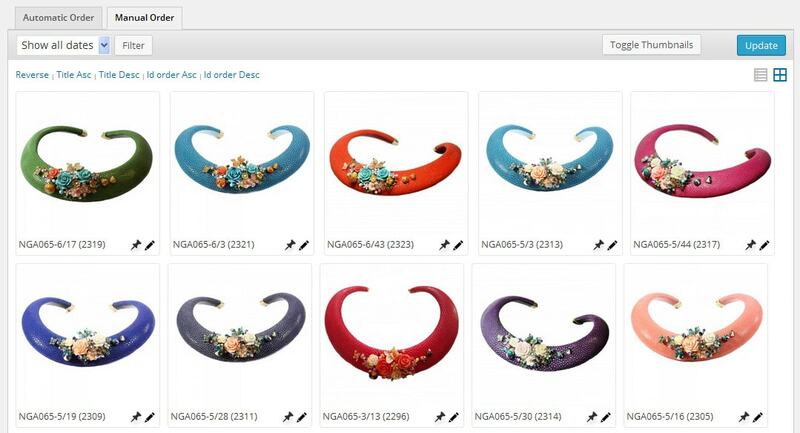 Sort more items at once by selecting, drag and drop multiple objects in a single pass. A nice functionality mainly to be used for large lists to speed up the sort process. A powerful Conditionals engine class provide an easy management of sorting apply area of your site. Simply create different sort lists of same type (i.e. post category), customize a different order, apply conditionals to match the exact sections on front side. Conditionals can also be used to exclude sort appliance for certain areas. The sort customization can also be operated directly within default WordPress custom post type archive interface providing a great support for users who prefer to stick with WordPress default menus. Order now your copy of Advanced Post Types Order and turn your WordPress posts order into something easy to manage and fun to work with. Need to update from Single to Developer License?